Located in Denver, CO, the Tenth Circuit Court of Appeals hears federal cases that arise from the federal district courts of the Colorado, Kansas, New Mexico, the Eastern District of Oklahoma, the Northern District of Oklahoma, the Western District of Oklahoma, Utah and Wyoming. 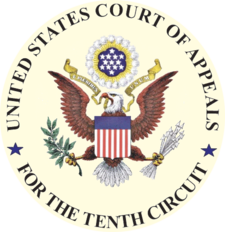 The Tenth Circuit has strict standards for the printing and filing of appellate briefs, and these standards differ from those of the other federal circuits. The starting point for a filling is, as always, the federal rules of Appellate Procedure. From there, the rules are modified by the local rules of the Tenth Circuit. Seven copies of each brief must be submitted along with one service copies to each party. One copy of each appendix volume must be submitted with one service copy to each party. The parties are encouraged to agree as to the contents of the appendix. In the absence of agreement, the appellant must, within 14 days after the record is filed, serve on the appellee a designation of the parts of the record the appellant intends to include in the appendix and a statement of the issues which the appellant intends to present for review. The appellee may, within 14 days after receiving the designation, serve on the appellant a designation of additional parts to which it wishes to direct the court’s attention. The appellant must include the designated parts in the appendix. The parties must not engage in unnecessary designation of parts of the record because the entire record is available to the Court. This paragraph applies also to a cross-appellant and a cross-appellee. The appellant must file an appendix sufficient for considering and deciding the issues on appeal. The front cover must specify whether oral argument is requested. Appellant’s brief. In addition to all other requirements of the Federal Rules of Appellate Procedure and these rules, the appellant’s brief must include the following (even though they are also included in the appendix): (1) copies of all pertinent written findings, conclusions, opinions, or orders of a district judge, bankruptcy judge, or magistrate judge (if the district court adopts a magistrate’s report and recommendation, that report must also be included); (2) if any judicial pronouncement listed in point one above is oral, a copy of the transcript pages; (3) in social security cases, copies of the decisions of the administrative law judge and the appeals council; and (4) in immigration cases, a copy of the transcript from the Immigration Judge’s oral ruling, plus copies of the written rulings of the Immigration Judge.